It’s Friday which means it’s indulgence day. I worked really late last night so I slept later than usual and J had a long day too so she wasn’t even home when I got up. About 45 minutes after I stumbled out to the living room feeling bad that I slept so late, I get a text message that I need to pick J up from work. I assumed we’d just go out to lunch, but she wanted to change clothes first so we headed home so she could get out of the work clothes and into something comfy. I threw out a couple places I wanted to try for lunch, but on Friday’s, she really likes to go places where we can kind of pig out. We’ve been doing pretty good at eating at home and watching what we eat during the week so the weekends can be a little extra special. The store front is on the Kalamazoo Mall a little north of South Street. If you’re familiar with the Mall, it’s near Rustica. 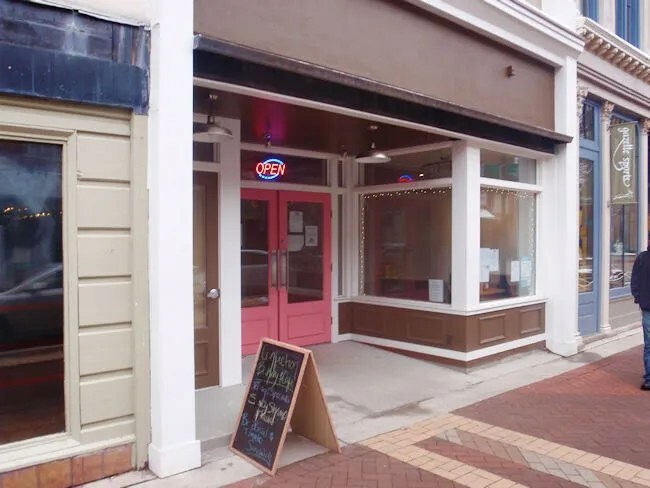 The doors are brightly painted and during open hours, there is a chalkboard on the sidewalk with today’s specials. We noticed a sign on the door that lunch is served from 11-2. I looked at my phone after I saw that and it was about 2:15. J asked if they were still serving lunch and they said yes. We were told to take a seat and the menus were already on the table. I’m not really sure what was in this space before, but I really like the setup of Confection. There are beautiful, aged hardwood floors that run through the whole building. There is a large counter area where you can purchase some decadent desserts or just order a coffee. The rest of the long narrow space is taken up by tables. We chose a two top along the wall right next to the cashier because, at the time, that was about all that was left. There were two laminated menus on the table when we sat down so we started looking at them right away. We had plenty of time to check it out. It took a long time for anyone to come over to us even though we were sitting right in front of the cashier. There were literally two waitresses five feet from us and no one acknowledged we were even sitting there. We were very close to going somewhere else, but decided to stick it out. Finally, one of the cashier’s picked up an order pad and started walking towards us…then got sidetracked at another table. Eventually she made it over and we were able to put our order in. I’m not much of a coffee or specialty drink drinker and J wanted to save some calories for dessert, so we both went with cans of soda. I got a Mountain Dew. J got a Diet Coke. We made sure to put our lunch order in right away. There were actually three choices that I was trying to pick between but went with The Brian Burger. 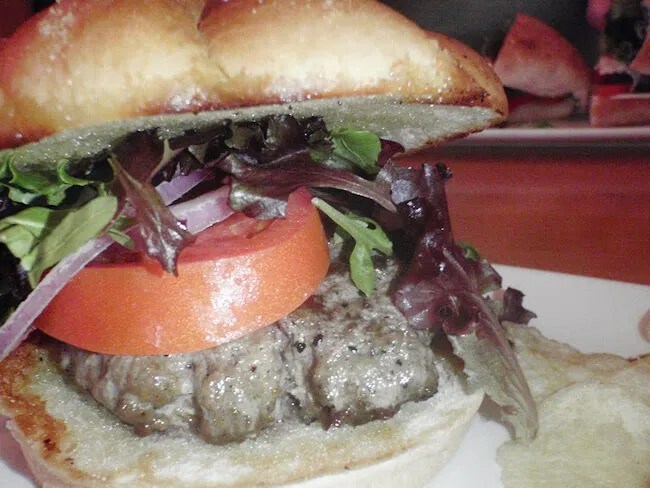 The meat is a choice beef patty cooked to a perfectly pink medium topped with mixed greens, tomato, and red onion on a Kaiser roll. The thing I really liked about this burger was instead of using a leaf of iceberg lettuce, they used mixed greens. The meat was very juicy and had a hint of onion in it. Not sure if it was like an onion soup mix or how the onion was incorporated, but I’m pretty sure I picked it up. Even though I’m not usually a fan of onions, this burger had a very good taste to it. The downside was that the meat patty was very small compared to the size of the bun. 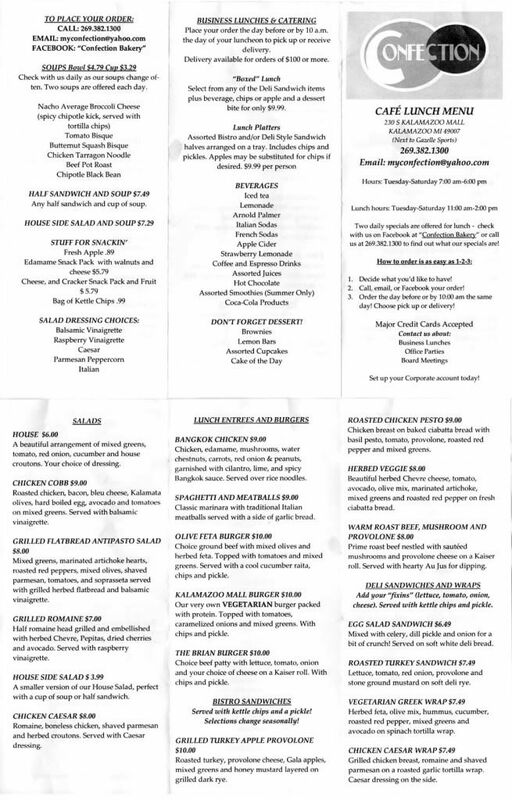 The cost of the sandwich was $10 which seems pretty expensive to me considering there was more bread than meat. Flavor wise, the burger was very good. Just not sure if it was worth the price. The sandwich came with chips and a pickle spear. J ordered the Roasted Pesto Chicken. 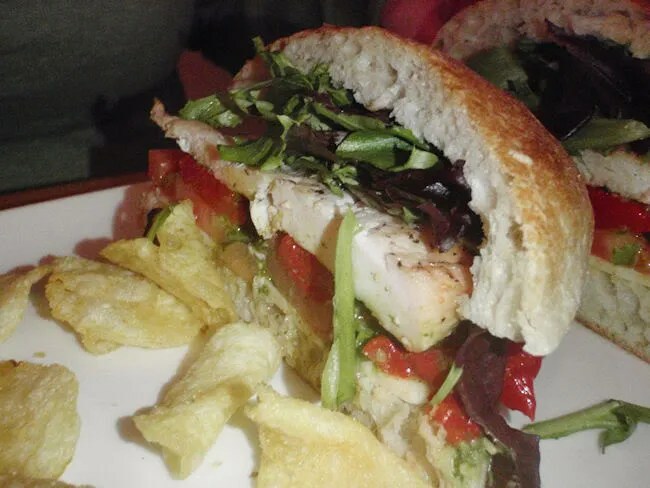 That sandwich is chicken breast on a baked ciabatta bread with a basil pesto, tomato, provolone, roasted red peppers, and mixed greens. She really enjoyed the sandwich and loved the bread that it was served on. Her sandwich was a buck less than mine and a much better value. Like mine, her sandwich came with chips and a pickle. As we were sitting there, we heard several people comment about one of the desserts in the display case near the door. After the fourth or fifth one, I finally got up to see what everyone was talking about. One look and I knew we had to have. We actually went with two desserts. We got a brownie and the Chocolate Ganache Bomb. We were splitting both items but both of us went straight for the Bomb. It was incredible and probably the best dessert either of us have either had. 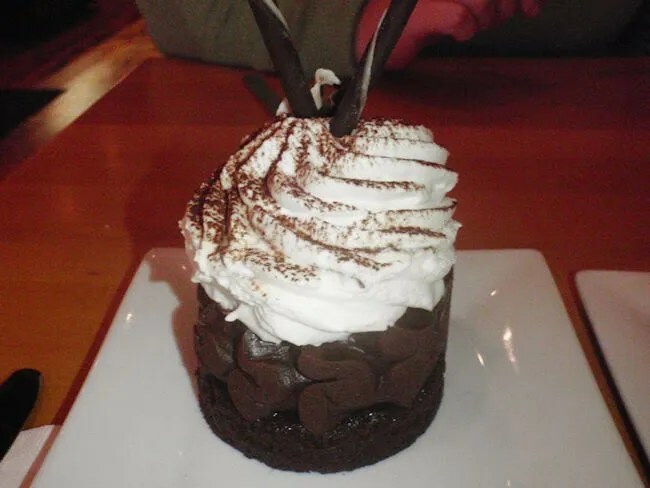 It’s just layers of chocolate and a whipped topping with two perfect chocolate straws sticking out of the top. If that wasn’t good enough, we still had a brownie sitting on the table. 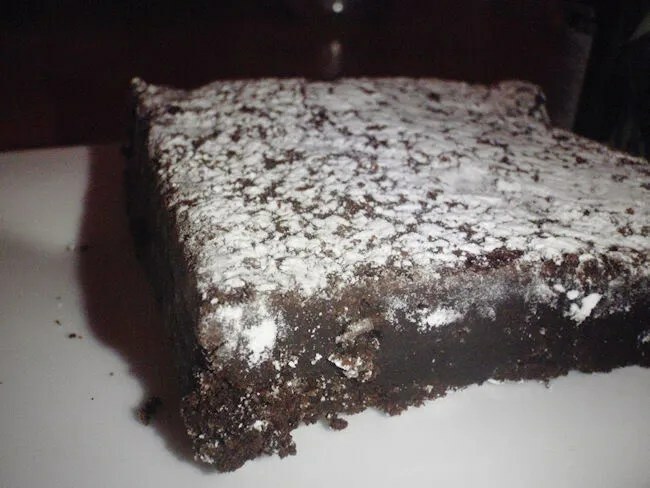 Again, probably the best brownie either of us have ever have. It was slightly chilled and had a layer of powdered sugar on top. Just delicious. Our bill was right at $30 with the two desserts. We were pretty worried with the way the meal started, but once our order was taken, everything went very smoothly. All of the food we had was delicious, but the desserts were to die for. The Chocolate Ganache Bomb is easily one of the best desserts either of us have ever had. I really wish they had later hours. They close at 6:00 which means we can’t go to dinner then hit up Confection for dessert which is what we’ve tried to do a couple times. 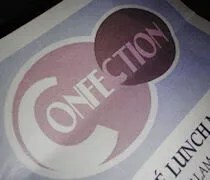 Still, I think anytime there’s a sweets craving, we’ll be heading down to Confection. Such a great addition to downtown Kalamazoo. THIS PLACE IS CLOSED & KEEPING DEPOSITS PAID FOR UPCOMING EVENTS..MY DAUGHTER WAS GOING TO USE THEM FOR HER WEDDING IN 2012 & GITI HENRIE PRESSURED US INTO PAYING AHEAD, SAYING SHE ALREADY HAD 2 WEDDING S SCHEDULED THE SAME DAY AS HERS. WELL NOW WE ARE OUT OUR MONEY & SHE IS CLOSED & NOT REFUNDING WHAT WAS PAID. SHE ALSO HAD A SHOP OPEN IN RICHLAND, MI— BEFORE OPENING THIS SHOP,,,,SO IS SHE JUST MOVING FROM PLACE TO PLACE, SO AS TO KEEP RIPPING PEOPLE OFF!!! !